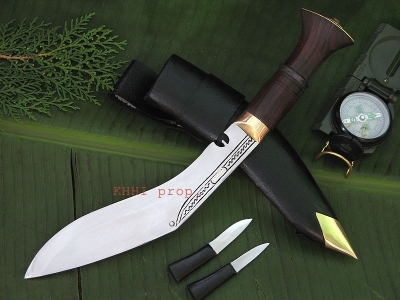 Parowal or rat tail tang, also known as the stick tang is the original type of handle used when kukri was first made or documented. The tang goes all the way thru the handle and locked at the end by metallic pommel. Khukris in this category include traditional kukris like Bhojpure and Chinautee that are very famous and well desired by local Nepalese. Traditional Parowal kukris are mainly for regular usage within and beyond domestic parameters. Its favorite of farmers, woodmen and villagers.